26.2 Quest: Running the Sahara - Charlie Engle - Coming to Atlanta! Running the Sahara - Charlie Engle - Coming to Atlanta! Would you run across the desert? Would you run day after day for months on end? If you haven't already heard about the Running The Sahara film, you have most certainly heard about Charlie Engle and the other "long runs" he has done. Very few can lay claim to the magnitude of what Charlie Engle has accomplished in the running community. Have you seen the film yet? If so, let us know in the comments what you thought. If you have not seen it and you live in Atlanta you are in luck. One week from today on February 17th at 7:30 it will be playing at the Landmark Midtown Art Theater.......... and guess what? I have a discount code which you can use to get $5 off of admission! The ticket includes admission to the screening, a Running the Sahara DVD, and a post film Q & A with ultra runner and film star, Charlie Engle, who will also be available to autograph your DVD. To take advantage of this discount just go to the Running the Sahara store at nehst.com/rtsln and enter promo code GROUPSALE (case sensitive) to receive $5 off the ticket price. Advance purchases are only $25 - $5 = $20 and are available until 3:00 pm the day of the event, but will be $35 at the door....... so don't delay! Where else can you get a film showing, the DVD, and be able to meet Charlie Engle....... all for only $20! So you say you haven't heard about the film, Running the Sahara? 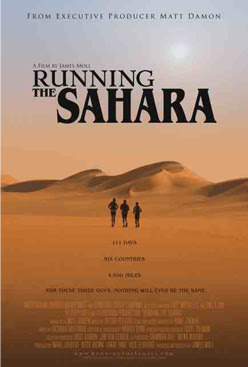 You can read a lot more about it on the film's website: www.runningthesahara.com or it can be summed up below. Running the Sahara chronicles an attempt by three ultra marathoners to run across the entire length of Africa’s Sahara Desert, tackling not only the elements, but also unimaginable physical and emotional obstacles. Their goal is to run through Senegal, Mauritania, Mali, Niger, Libya, and Egypt, anticipating two marathons per day, for eighty days - without a day off. The expedition spans 4,300 miles (6,920 kilometers) and passes through six countries. Charlie Engle from the United States, Kevin Lin from Taiwan, and Ray Zahab from Canada, have run together in marathons before. But this expedition is different. It’s a grueling test of will – a story about the human spirit under fire – and a chance to accomplish something that no known person has ever achieved. A rarity, I got a little choked up after visiting the website for "Running the Sahara". I'm sure it was due to the fact that these men completed a journey that was nothing short of amazing. I can only imagine what it took them to complete it, physically and mentally. I'm currently on this path myself and have been since completing my first marathon in 2008. Thank you for sharing the site info. Take care and keep up the good work! Flameminx - thanks for sharing!